This article is about the ceremony of this name. It is not to be confused with Awards for world music. The World Music Awards is an international award show founded in 1989 under the high patronage of Albert II, Prince of Monaco. Awards are presented to the world's best-selling artists in the various categories and to the best-selling artists from each major territory. Sales figures are provided by the International Federation of the Phonographic Industry (IFPI). Nine awards are voted online by the public. The awards are gold-plated, each depicting an artist holding the world. 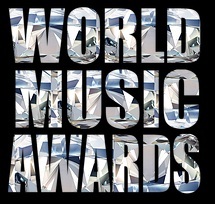 Many of the World’s best Performers have graced the World Music Awards stage including Alicia Keys, Andrea Bocelli, Avril Lavigne, Beyoncé, Bon Jovi, Britney Spears, Carlos Santana, Celine Dion, Cher, Chris Brown, Christina Aguilera, David Guetta, Destiny’s Child, Eminem, Enrique Iglesias, Enya, Fall Out Boy, Femi Kuti, 50 Cent, Flo Rida, Jacky Cheung, James Arthur, Jamiroquai, Jason Derulo, Kanye West, Kylie Minogue, Jennifer Lopez, Leona Lewis, Lionel Richie, Ludacris, Marc Anthony, Mariah Carey, Maroon 5, Michael Jackson, Miley Cyrus, Namie Amuro, Nelly Furtado, Outkast, Pharrell, Pink, Prince, Puff Daddy, Ricky Martin, Rihanna, Rod Stewart, Roxette, Savage Garden, The Scorpions, The Script, Seal, Shaggy, Shakira, Shania Twain, Stevie Wonder, Stromae, Tina Turner, Tinie Tempah,Tony Bennett, Vanessa-Mae, WillIAm, Will Smith and Whitney Houston to name a few. The World Music Awards is one of the most recognized Award shows on the planet with over two decades of media success! The Awards were last held in Monte Carlo in 2014. The World Music Awards builds hospitals, schools and orphanages through the Monaco Aide et Presence Foundation and the Combonian Missionary Association which assist underdeveloped Areas in Africa, Asia, Eastern Europe and Brazil. There are 23 operational Centres saving lives and providing shelter and education including a hospital at Port Bouet in Côte d'Ivoire serving a population of over 170,000 inhabitants, a hospital, 2 homes and a school in India, a home in Sri Lanka for handicapped girls, a hospital in Rwanda, a hospital in Darfur, a hospital and school in Niger, a health centre and home in Cameroun and a hospital in Cambodia. Additionally, a home for abandoned children in Brazil, plus a hospital, school and 12 homes in Madagascar have been constructed, and the complete renovation and extension of an existing hospital in Mokatam, Egypt. Apart from the world's best-selling artists in the various categories and the national best-selling artists, special millennium awards were presented in 2000 to the world's best-selling recording-artist of all time. The awards were presented to Michael Jackson and Mariah Carey in the male and female artist award categories. ^ "IFPI — Representing the recording industry worldwide". www.ifpi.org. Retrieved 2019-04-25. ^ "World Music Awards :: Photos". www.worldmusicawards.com. Retrieved 2019-04-25. ^ "World Music Awards - May 2000". Archived from the original on 2000-10-03. Retrieved 2019-04-07. ^ a b "World Music Awards :: Awards". Retrieved 6 April 2014. ^ "World Music Awards; section entitled "The Awards"". Archived from the original on 2000-10-03. Retrieved 2019-04-07. ^ "Michael Jackson Millennium Award". bigstory.ap.org. Retrieved 3 September 2013. ^ "Winners of the World Music Awards". Société des bains de mer de Monaco. Archived from the original on 15 October 2000. Retrieved 2 September 2013. This page was last edited on 25 April 2019, at 13:50 (UTC).